I was a dedicated Saturday morning cartoon watcher for a good portion of my childhood. For those of you who don’t know what I’m talking about, back in my childhood there were somewhere between 3-8 television channels you could get. No VCRs, DVD players, Internet or any kind of streaming anything (except maybe the stream of static for a far away station). In other words, if you wanted to watch TV, your choices were limited. Saturday mornings became the time that a number of different channels put cartoons on. Back to back to back all morning long. The best of the bunch, though, was The Bugs Bunny / Road Runner Hour. It was there that I first heard the word fricassee. In an episode called Duck!_Rabbit!_Duck!, Daffy Duck is trying to get Elmer Fudd to shoot Bugs instead of going duck hunting. Bugs convinced Elmer that Bugs is a fricassee rabbit and that there is a special license needed, Daffy goes to work on creating a fake license. Unable to spell fricassee, he asks Bugs who then spells it out D – U – C – K.
Fast forward 38 years, and I’ve made my first fricassee. 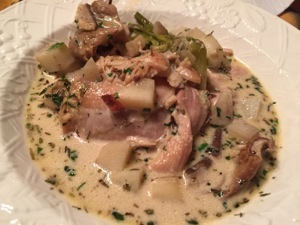 Not from rabbit, or even duck, but fricassee never the less. Maybe I should have called it FogHorn LegHorn Fricassee! 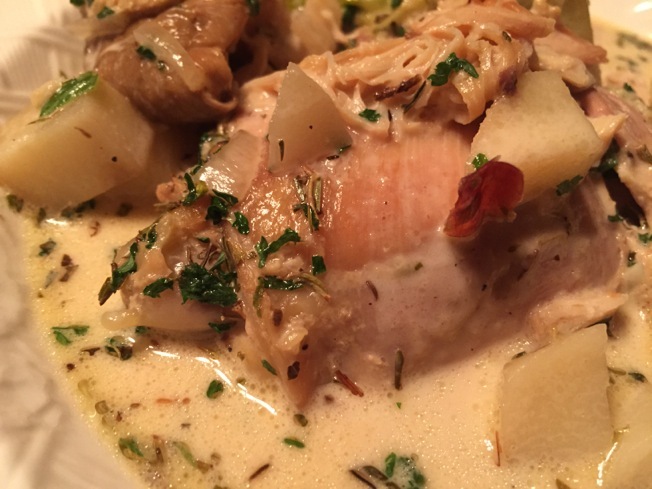 A fricassee is nothing more than a method of cooking where the meat is sautéed, braised and served (typically) with a white sauce. I love cooking with boneless thighs. I didn’t have any morel so any earthy shrooms will work. So great you won’t miss the rabbit! 1. 1. Heat chicken broth in a medium saucepan over medium-high heat. 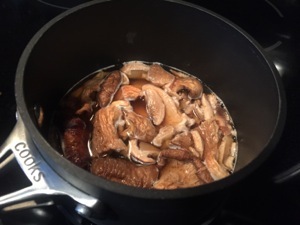 Clean morels by rinsing thoroughly with hot water; add to broth. Turn off heat, and let morels soften. Drain mushrooms through a fine sieve, reserving stock, and set stock and mushrooms aside. 2. 2. 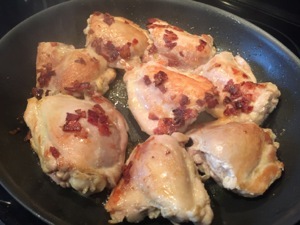 Season chicken with 1/2 teaspoon salt. 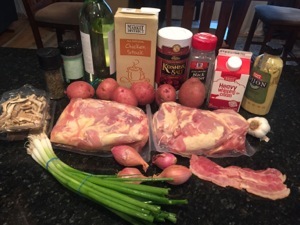 Cook bacon in a large nonstick skillet over medium heat until crispy and fat is rendered. Add chicken, and cook 15 minutes, turning once, until browned. Add wine, reduce heat to low, and cook 10 minutes. 3. 3. 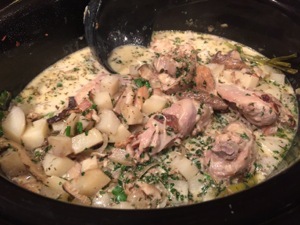 Remove chicken, and place in a slow cooker. 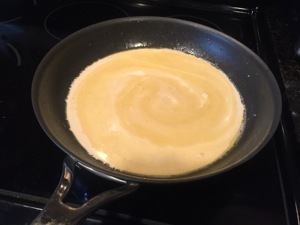 Add reserved stock to skillet, and deglaze by stirring to loosen particles from pan. Add cream, and bring to a boil. Add mustard, and whisk to blend. 4. 4. Scatter shallot, baby leeks, potato, garlic, and reserved morels around chicken, and pour cream mixture over chicken and vegetables. Add pepper and remaining 1/4 teaspoon salt. Cook on HIGH for 3 to 4 hours or on LOW about 5 hours or until tender. Stir in fresh herbs, and serve. ISO remember waking up and watching all those cartoons until my mom finally came down stairs and made us turn it off. The Jetsons, Flinstones, Bugs Bunny – good times.